The 26-year-old UIC graduate student died last fall. 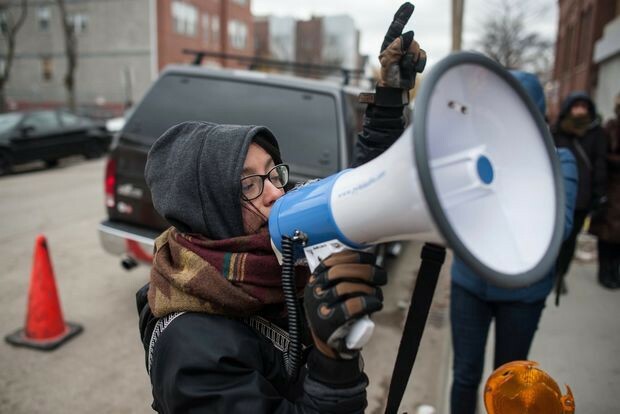 PILSEN — Family and friends of the late Alma Zamudio have announced a scholarship to help students carry on the beloved Pilsen community organizer’s legacy. The Alma Cruz Zamudio Empowerment Scholarship will be awarded to first-generation students of color who have shown a commitment to community organizing and social justice issues. The merit-based scholarship is open to UIC juniors, seniors and graduate students who have demonstrated a commitment to organizing around affordable housing, immigration, transportation, workers rights and environmental justice.“We want to make sure that her legacy continues,” she said. “The best way we can do that is by helping young people like her. ”Her sister Maria Zamudio said the scholarship will be awarded this fall to two students who embody the principles Alma lived for. Alma Zamudio received her bachelor’s degree in urban planning and public affairs from UIC in 2013. The 26-year-old UIC graduate student died last fall ﻿from a chronic illness. Before her death, she advocated for better wages for migrant workers and lobbied in Springfield for college grants to assist first-generation students. She also worked to combat the displacement of low-income families in Logan Square and Humboldt Park. Her work also helped resurrect the №. 31 bus, providing much-needed public transit to the Little Village community. Following Alma’s death, friends started a GoFundMe page to help the family with funeral costs and establish a scholarship in her name. In a matter of days, the fundraising efforts reached and exceeded the initial goal of $10,000, longtime friend Susan Aguinaga said. Aguinaga, who helped launch the crowdfunding page, said she “wasn’t too surprised” the campaign surpassed its initial goal. “Alma touched many peoples’ lives,” Aguinaga said. “I thought it was a beautiful thing scrolling through comments of donors, some people who didn’t even know Alma, but heard her story and were so moved by all that she had done in her life,” she said. More than 400 people attended Alma’s funeral services. At the services, people lined up to comfort her family and share stories of how Alma impacted their lives. The scholarship selection committee will be accepting applications through June 4, and two UIC students will be awarded $1,500 scholarships this fall. “I think it’s important to realize that no matter how young students might perceive themselves to be, they have the capacity to really create change in their community,” Aguinaga said. Maria said her sister worked tirelessly around access, equity and creating opportunities, which is why she thinks the scholarship will be a good way to honor Alma’s legacy. Zamudio and the committee behind the scholarship are working toward offering the award to students every fall. Learn more about applying for the scholarship here.